I am the master of getting side-tracked. I was doing something else (learning a song)—and now I’m doing this. I accidentally slipped and fell into my blog. You may be thinking: “this dude has a short attention span.” But, then again, I just wrote that in quotations, so you must have said it out loud. I’d fix it—but I’m not the boss of you. None of this is really the case, anyway. I blame my smart phone, and in that sense, I take full responsibility for the rest of this. I’m a cyborg in 2018 with an augmented intelligence, collectively referencing the world wide web on a whim, or more to the point, interrupted by reminders set on my calendar, because at some point, I thought it was important to be reminded. That’s how I ended up here. Not as much as you think Xzibit. I drive a Honda Civic—but I like the way you think, moreover, I like how you overthink thoughts. We’re like ships passing in the night… with cars on it. My bills are paid on time. And I got a blog out of it. 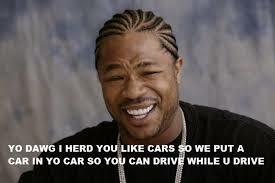 I also found some pictures of Xzibit. If you would have asked me yesterday, what I was doing right now, I never would have guessed it. I wonder what Xzibit is doing right now. I hope he is putting cars inside of cars, if it makes him happy. Sure, it’s a meme, but why not just take it at face value? Good morning! (I made it just in time for noon).